For anyone who needs to find the detail on the Pin-to-pin in order to make repair on the cable. Good to be sold coupling to tools for cable repairs such as cutter, stripper, crimper, etc. Features a brand new compact design with the functions of the original LANtest. 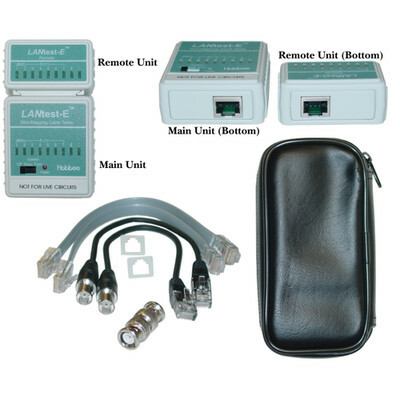 LANtest-E maps actual wiring configurations for 10/100BASE-T cables, BNC cables, RJ45/RJ11 modular cables, 258A, EIA/TIA 568A/568B and token ring cables. With the included Remote unit, one person can test cables installed in walls. More Product InfoThis LANtest-E Cable Tester will test and map wire configurations for Cat5e, Cat6, Cat6a, BNC, Telephone and 10/100/1000 BASE-T cables. The included remote unit makes testing patch panels and in-wall installations a breeze. The LANtest-E gives you quick and accurate test results the first time, every time. A product like this would have simplified and taken the mystery out of a number of my past projects. I'd held off due to the expense as well as the lack of clarity re: which tester would be best for me. There are frankly too many options available! I'm pleased with the LANtest-E. It meets all my needs, is simple, and was offered at a reasonable price by CableWholesale.